Cheeks are the aesthetic focal point of the face. They have the ability to make the face appear male, female, young, old, attractive or less so. Men and women have different ideal shapes when it comes to their cheeks. Women look soft, feminine and attractive with full round cheeks. Men, on the other hand, are ideally suited for cheeks that are short and narrow which gives the face an overall chiseled or angular appearance that is perceived as ruggedly masculine. Cheek Lift, also known as malar or submalar augmentation, is a plastic surgery procedure which uses implants or otherwise to add definition and fullness to the cheekbones. 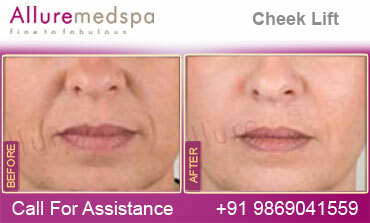 Cheek augmentation can add a more balanced appearance to the face. The surgery may be performed on its own or it may be combined with other procedures like a facelift. During the cheek lift procedure, Dr. Doshi vertically lifts the sagging cheek tissues to a more youthful position where the fatty tissue can help support the skin contours. He begins by creating well-concealed incisions on the scalp above the hairline and in the mouth above the gum line. Through these “hidden” incisions, he restores the facial tissues onto the cheekbones. The tissues are suspended into place with sutures that dissolve within a month, long after the tissues have firmly healed to their new location. As the weight of the fat is shifted, typically the skin of the cheeks and lower lids will return to their former location. The cheek lift can be combined with a face and neck lift to fully rejuvenate the face and neck in a natural appearing fashion. Your surgeon is the best person to decide after a thorough examination which of the above procedures suits best. Dr. Milan Doshi is a board certified cosmetic surgeon and the member of ASPS, he is highly specialized in facial surgery procedures. He takes an extraordinarily detailed approach to each procedure, and believes there is no such thing as a standard face lift. Instead, he customizes every facial surgery to the needs of the patient. It is Dr. Doshi’s goal to maintain the patient’s natural beauty. Therefore, during the chick lift surgery, Dr. Doshi is able to precisely tighten and sculpt facial features and restore volume, preserving the patient’s natural facial contours for a natural and vibrant outcome. As such, he has unparalleled knowledge of the underlying structures of the face and experience in dealing with delicate facial nerve. In most cases, cheek lift surgery will be performed as an outpatient procedure under general anesthesia. This procedure generally takes about two hours, although exact times will vary. Recovery after cheek augmentation takes about a week. You may have little difficulty moving the mouth and lips at first, and dietary restrictions may be necessary. Allure MedSpa which is renowned for its state-of-the-art internationally acclaimed services,offers affordable and cost effective cosmetic procedures. To know more about the cost of your procedure request a consult by filling the form below. Your consultation is your chance to ask questions about cheek lift and put your mind at rest. Your surgeon will be able to offer you full explanations and answers to all of your queries. Over the years I have worked very hard. I have been a mother, a wife, a successful career woman. I have completed all my responsibilities perfectly. All these years I have not paid much attention to my own face. One day I realized that at the age of only 40, I have started looking quite old. My cheeks have started sagging and have become droopy. I applied lots of creams and lotions for over a year, but all that was a total waste. Top of all, I was even wasting my lots of money. 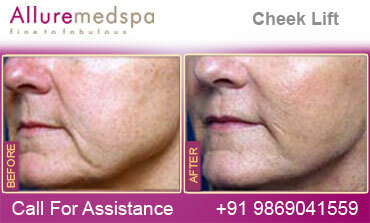 One day, as I was searching through the internet, I came to know about the Allure Medspa. I gained more and more information about the surgeries and about the surgeon Dr. Milan Doshi. I went through the patients speeches and heard many good things about him. Next day, I made contact in their office and had a talk with Dr. Milan Doshi. He asked me to send some of my photographs, so can evaluate the type of surgery that I should have. I did just that. Next morning I got a call telling me to come to India for my cheek lift surgery. I made my tickets and flew there. When I visited his clinic Allure Medspa, I just felt just like home. The surgery was proceeded and within two hours of the surgery, I started feeling the difference. I came back home after 2 weeks and got praise from all my relatives. I am a happy soul now. You should avoid strenuous activities for a week after surgery to decrease any swelling. Most patients return to work in 10 days to two weeks. Occasionally, some patients report that they can feel the endotines when they touch their cheek area. The endotines will gradually disappear, and will not be noticeable after a while. Individuals should keep the head elevated as much as possible, and utilize cold compresses in regular intervals for several days. These measures will help minimize bruising and swelling. Occasionally, a partially numb sensation may linger in the upper lip, this resolves with time. To ensure a safe surgical procedure, your current health history as well as your medications and drug allergies will be reviewed. You will be asked to stop taking any medications that can thin your blood and increase your risk of bleeding before the surgery. We are pleased to offer and arrange comfortable lodging, restaurant, and commuting to ensure a memorable pre-and post-surgical experience for our out-of-country patients. Please feel free to contact the Counsellor via Book a councelling session for assistance with any of your travel and planning needs. The natural aging process will continue, and the skin around the cheeks may begin to naturally slide again after several years, although individual experiences will vary. To help maintain the outcome, patients are encouraged to avoid smoking, excess sun exposure, and dramatic changes in weight. By following these suggestions, benefits almost always last 10 years or longer. For more information on Cheek lift surgery and our extensive aftercare program or to Book an appointment, call Allure MedSpa at: +91 9869041559.